These are some of the things I bought, this is not all. I did some grocery shopping too, but I can not show that here. These are the beauty products I bought. I will list them down below with their prices. 1. Large Mirror - Rs.95/. 2. 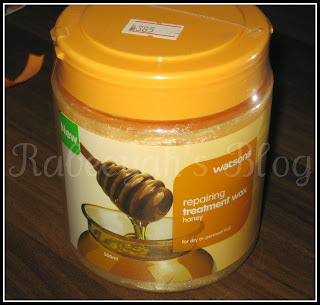 Watsons Repairing Treatment Wax - Rs.385/. 3. 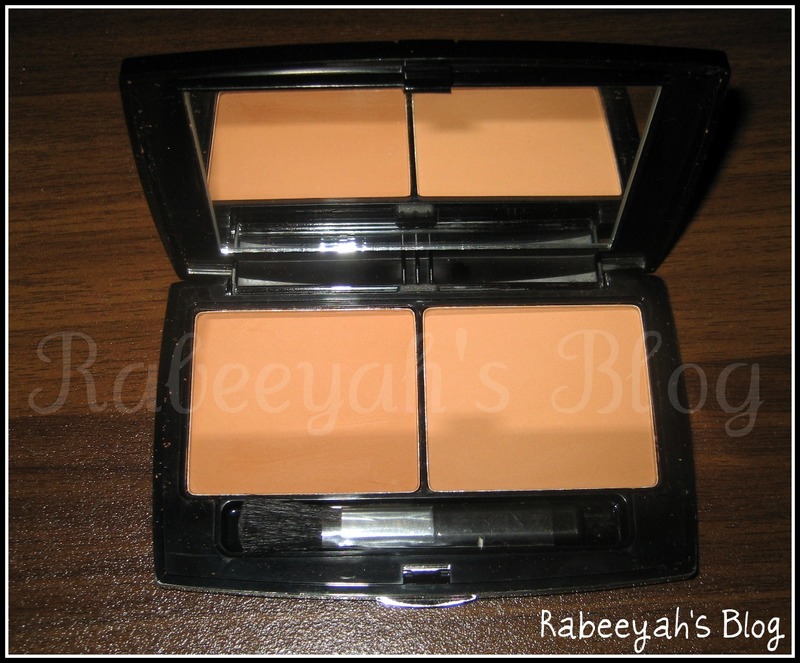 Christine Contouring Powder - Rs.250/. 4. 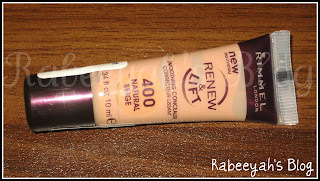 Rimmel Smoothing Concealer - Rs.550/. 6. Luscious Metallic Bold pencil in Peacock Green - Rs.245/. 7. 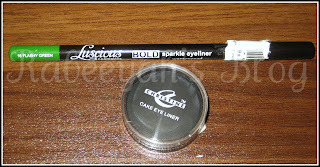 Christine Cake Eyeliner - Rs.190/. 8. 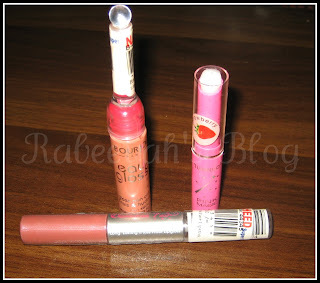 Glamorous Face Stay on Lip gloss - Rs.160/. 9. Pink Magic Lip - Rs.60/. 10. 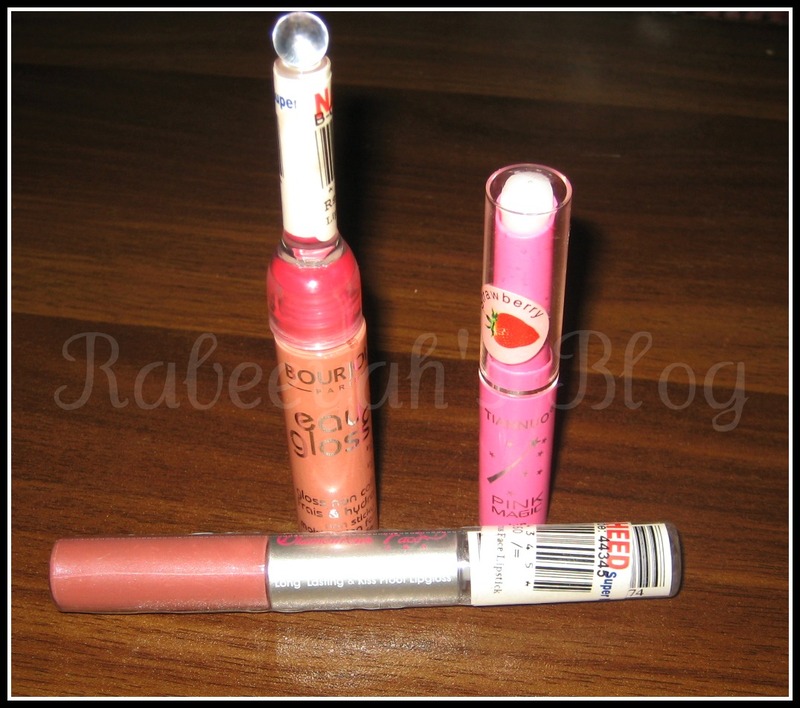 Borjois Lip Gloss - Rs.75/. 11. Suave Fresh Deo - Rs.215/. 12. 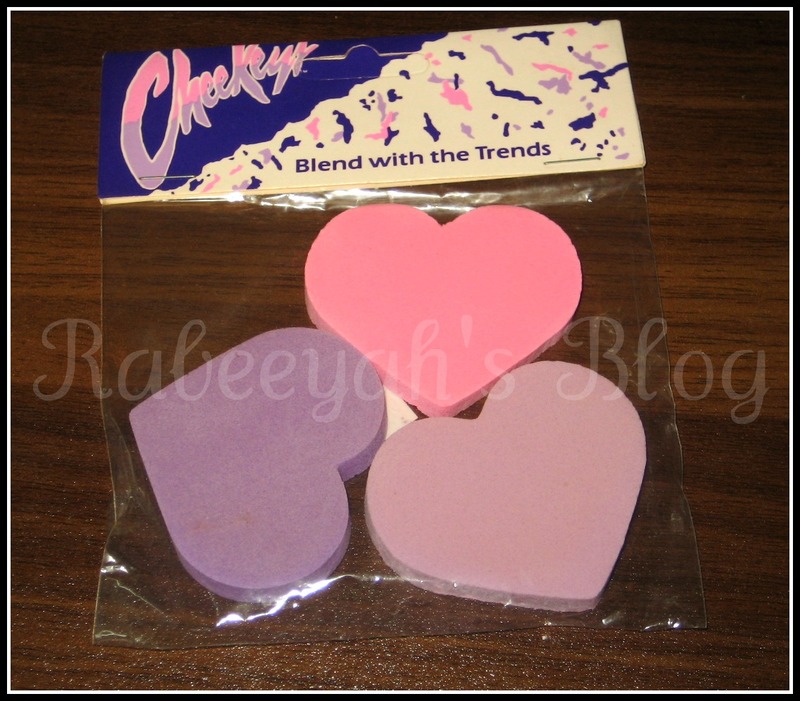 Cheeky Blend sponge - Rs.50/. 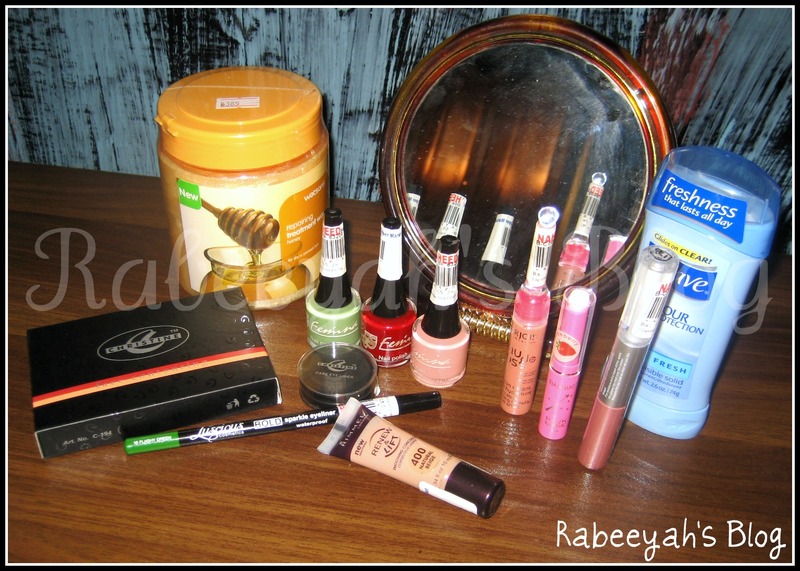 From all of these stuff I wanted to buy just a Rimmel concealer and the deo and I ended up buying other things :D The Glamorous Eyeshadows for the winner is not in the picture aswell. Aren't these sponges cute? I apply my liquid foundation with my fingers or stippling brush. But when I use paint stick for a tutorial, I really need a sponge. These ones looked cute and they are just for Rs.50/ so I thought of picking them up. They are really soft and nice. I thought they will be not that good because of the low cost, but they are good. If you are looking for sponges, do check them out. Finally a BRONZER :D I always went to Etude corner to check the shade and buy the bronzer or say contouring powder, but then I always thought that whether I will look good with it or not. I looked dark when I once used bronzer. But that was too dark and shimmery. This time, I saw this, and there are 2 shades in it. This is in number 1 and the other number 2 is a bit darker than this one. For me it was too dark. I have not tried this one yet, but it seems good. I will try it in my next tutorial and will share the review too. 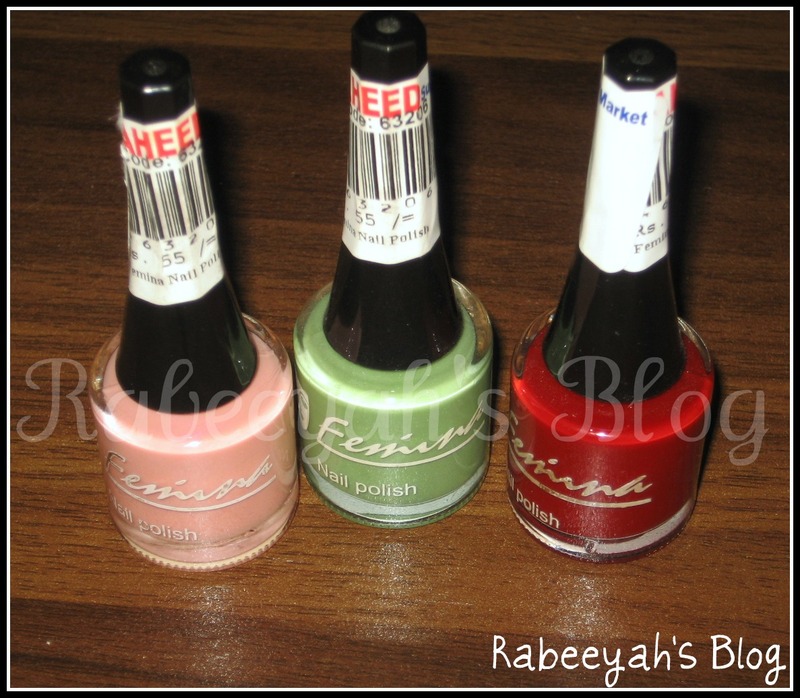 Thanks to one of my follower, who actually made me look for nail polishes which are low in cost :D Actually, I saw many brands, they were low in cost but they had those typical colors which I don't like. This time I saw these and I was actually looking for these 3 colors. I was also looking for yellow and they had it. But, I didn't bought it. Next time I will buy this color. Pink and Tiffany Green are lighter ones. They need 3 coats. But the Maroon one is gorgeous. I can't wait to try it. The brush applicator is good too. 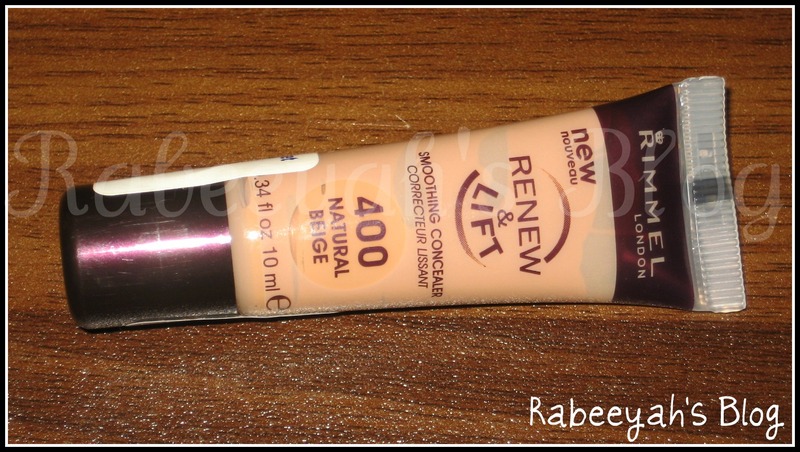 Finally I bought this concealer. Last time I went, they had only 2 shades. I was looking for a bit darker shade as I am fair but my circles are very dark. I have Luscious concealer in No 2, but it is too light for me. I finally found a perfect shade for myself. Yayiee! It is quite pigmented and thick too. Little amount of it covers all. After a long time I bought glosses. The one in pink is a Pink Magic, it is white in color but when you apply it on your lips, they will turn into natural pink and it is a lip balm too. I kind of like it. I always saw them in one jar but never picked it up. This time I had to. They have 2 colors and flavors. I bought it in my favorite color Pink and flavor cherry. The other one is by Borjois (fake obviously), it's a natural color. For the first time I saw the Glamorous Stay on lipstick/gloss. One side it is a colored gloss, which when you apply sticks to your lips and it is bit sticky too. Then you have to apply the clear gloss. It stays for quite long. I like it, they have alot of shades. But I don't know whether they are good or not. I didn't liked the sticky party of the color. Else the color I got is natural pink. Try it before buying it. This is something I always saw at Naheed but never had time to read and see what it is actually and what does it do. This time I was buying Boots hair treatment solution, which comes in different colors and flavors. But, that one looks more like a conditioner. This one is a Repairing Treatment Wax - Honey flavor. I picked the Boots one, then I kept it back and bought this jar. I LIKE this. I will do a separate review on it. 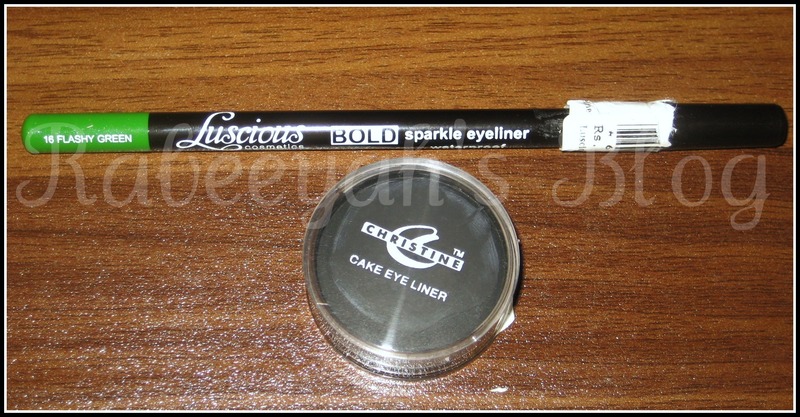 I was looking for cake eyeliner since long, this time again I finally bought it :D You can see the Luscious Bold metallic eye pencil in Flashy Green on top and Peacock Green at the bottom. I haven't used them so can't review, plus this post is getting long. I hope it is not getting boring. Sorry if it is, but I wanted to review about the little things I used with the haul. So that if anyone of you want to buy it can go and buy. I used cake eye liner, I liked it but it too sticks to my upper lid :( I think I should buy the liquid liner. I hope you enjoyed my HAUL + Review post. Do let me know which one you want me to review first. Take care. Love you all. i would like you do a review on cake liner, and bronzer (coz m looking one for myself too. @ Sarah,Nooo :D Original Borjois can not be that cheap. But it is good. I mean not that pigmented, but for daily purpose you can use it. Really? I will check your review on that mint green color. They are so cute and I love the brush. From where do you do your shopping ? thanks , i'll wait for your review. I agree.Naheed is a good place to shop for cosmetics and beauty stuff. And everything is under one roof which is really helpful. Yes, I love Naheed. It was conjusted earlier, but the new one is quite spacious. Don't worry Sidra, it's not hard. First floor has everything and the shelves have names on it, like shower items, creams etc. It is very easy to find things. Just walk in and explore and if you want any help, I will come there and we will shop together :D How about that? and the best thing is you go for reasonablly priced products !! i ve a question about sponge use. how often do we change/wash a sponge? i apply my foundation wd my fingers too but sometimes for heavy coverage and perfect blending i use a sponge. these little heart sponges look cute n im gona buy em just for the heck of it hehehe!! great haul , how is the concealer any good ? and im kinda fair toned so im in delama should i buy a goldenish concealer of lighter concealer ? Maybelline product color show is available in naheed or not?